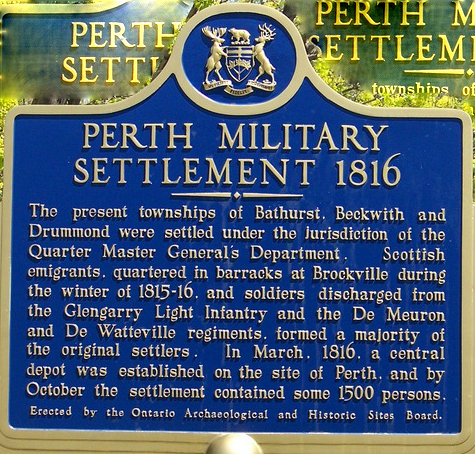 The Perth, Ontario Military Settlement was founded in 1816, and as part of the local celebrations for the 200th anniversary in 2016, many of the nearby communities will be collecting local stories for publication in commemorative books. Both Tay Valley Township and Drummond-North Elmsley Township are producing commemorative books and are looking for submissions from former and current residents. Please send your family stories, special memories and recollections to be included in these legacy publications. Family life, stories about farming, anecdotes about attending local schools, memories of churches and local businesses are all welcome. They are also interested in stories of special events or stories that ‘made the news’ during your lifetime. For those who have stories about life in Tay Valley, (formerly Bathurst, North Burgess & South Sherbrooke), please contact Kay Rogers at 613 326-0363 or email to: cameronrogers(at)xplornet.ca. If you have submissions of stories for Drummond-North Elmsley Township please contact Karl Grenke kgrenke(at)dnetownship.ca. This entry was posted in Historical Interest and tagged Arlene Stafford-Wilson, Drummond North Elmsley 1816-2016, Drummond North Elmsley 200 Anniversary, Perth Military Settlement, Perth Ontario, Perth Ontario 1816-2016, Tay Valley Township 1816-2016, Tay Valley Township 200 Anniversary. Thank you, Arlene, promoting this!